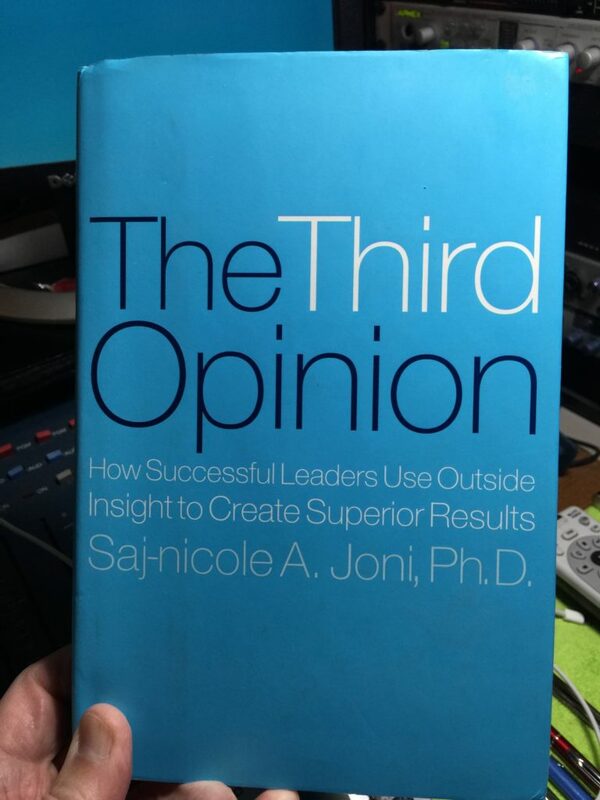 Today we’re continuing a chapter-by-chapter summary of the book, THE THIRD OPINION. Last time we discussed chapter 1. If you missed it, click here to go listen to it. It’s about 30-minutes long. Chapter 2 is entitled, “The Three Habits.” Ms. Joni introduced us to these in the first chapter. The book began with the story of a top leader facing a complex challenge and realizing he needed some help to think through the proper decision. But every time he thought about particular people he could easily disqualify them as fit for the job. He’s going to have to rely on the HABIT OF MIND to solve this problem. He needs a third opinion. Throughout his career, he has incorporated some trusted outside advisors into his inner circle. Occasionally he’s had to rely on these people as a sounding board. They’re interested in helping him, but they’ve got no dog in the hunt so he trusted them. These aren’t relationships you can cultivate in a moment of crisis. You foster these relationships in anticipation of events where you need the help. This means you have to cultivate your HABIT OF RELATIONSHIP. Finally, in addition to seeing that this issue needs to be addressed immediately, this leader needs to be able to push away the urgent things on his schedule today in order to deal with it. The ability to tackle many issues on your plate and still make time for surprises is what Ms. Joni calls the HABIT OF FOCUS. Leaders have to be able to distinguish between the essential and the urgent and how now much time to allow for each. The story of our leader unfolds as he contacts 3 people who give him various levels (and degrees) of help – outside help. A third opinion if you please. His story sparks some questions we should be asking ourselves. What kind of network have I built, and how and when do I use it? Are there teachers, mentors, friends, and activities that have been particularly important in my development at some stage in my life? How do I include my spouse or significant other, family members, and personal friends in my current leadership circles? When have I had a conversation or ongoing dialogue where I significantly changed my understanding or learned something I did not expect? What were the conditions that led to the insight? Are there critical areas for me now where I have no thinking partner, or where the thinking partners, or where the thinking partners I have are lacking expertise, perspective or appropriate structural trust? That brings us to chapter 3, HABIT OF MIND. The habit of mind means you’ve cultivated the ability to think and lead in a high-speed world of change and interdependencies. There are three facets to this habit of mind: mastery of three levels of thinking, curiosity, self-knowledge, and spotting great talent for your inquiry team. Today’s leaders must be able to integrate old and new information, plan more flexibly and be ready to redefine the very way they understand their job, company, and market. To do this, leaders have to develop mastery in three basic types of thinking: application, expert, and exponential. Keep in mind, this is an integration of all three kinds of thinking that leaders will find their ability to successfully deliver results over time. Application thinking is focused on planning and implementing well-understood methods in ways that provide replicable results. This helps leaders readily identify the characteristics of a problem, and with the benefit of experience and history, find a solution. Application thinking consumes the greatest share of most managers’ mental energy. Expert thinking begins with people who have developed deep understanding and expertise in specific fields of knowledge. Expert thinking is brought to bear when challenges and issues are new or unique and don’t fit easily into a solution by a known method. In many cases, these issues have a highly technical component. Expert thinkers bring new perspectives to diagnosis and the technical know-how and problem-solving abilities to develop custom approaches. They also bring with them access to a network of related experts whose thinking may be brought to bear on various parts of the problem. Yes, expert thinking and application thinking are related. As the author has already discussed, exponential thinking is the work of developing multidimensional framing that helps leaders see all sides of a complex issue. This is the most difficult kind of thinking to master so it deserves greater attention. Until you master this you won’t be able to take full advantage of the third opinion. The intent of application thinking is replicable results. The intent of expert thinking is innovation and customized solutions. The purpose of exponential thinking is to achieve insight. The starting point for exponential thinking curiosity about what is unknown and about unexplored relationships. This means the inherent nature of exponential thinking is the need to engage with others who bring different perspectives and who are capable of helping you explore issues outside of your awareness, mental models and current understanding. Exponential thinking contains two key elements: first, expertise in one or more fields of knowledge, and second, the capacity to apply that expertise to explore interdependencies, make sense of multiple perspectives, unearth and validate assumptions, and envision possible futures in ways that yield new ideas and insights. Exponential thinking contributes to insight shifts that occur when problems are reframed and then explored at a higher level of context and complexity. What are the mental models that govern your thinking? Your mental models are made up of assumptions about how your business works. They’re also made up of the fundamental assumptions you have about the world and your place in it. Our mental models deeply impact how we make sense of things and how we choose to act. They develop from individual experience and from our cultural and intellectual heritages. The starting point for exponential thinking is to develop an awareness of our mental models and those of others. Two: Develop your ability to discern patterns. Our ability to see and recognize patterns is one of the fundamental human sense-making capabilities. As leaders, we need to look for patterns constantly and practice spotting them in different situations and in a variety of contexts. Three: Check and recheck for hidden assumptions. Much of what we do each day is guided by assumptions we hold. A key part of exponential thinking is unearthing and examining our own assumptions and how they affect our thinking. Many tools can help you unearth assumptions about your business. For example, Six Sigma is a method that enables you to increase operational results and quality in sustainable ways. Part of the power is that it uses a structured approach to move from operational conjecture to measurable fact, revealing hidden assumptions. There are a variety of business building tools aiming to do the same thing in most areas of business operations. Four: Create varied scenarios of the future. Exponential thinkers consider mental models, patterns, and assumptions, then use them to develop a portfolio of scenarios for the future. The exponential thinker has the ability and judgment to create multiple views of the future, compare one to another, determine their relative probabilities, and commit to a course of action that allows for the ability to switch if and when needed. Five: Look for ways to broaden your line of sight. Everyone is looking for ways to get more value from less. To develop the necessary habit of mind for successful leadership today means you have to think very carefully about how you get your information, its sources, and its sources’ sources. Information comes at us fast and furious. As a result, we don’t have time to parse the data and consider how reliable it may be. We risk making decisions on outdated, incomplete or distorted information. Most information that reaches us has been filtered for perspective and spin. When they become too isolated, leaders lose their awareness of the strategies, norms, beliefs and agendas of anyone besides their own teams. That isolation can have a high cost. Winston Churchill was very aware of this problem. Knowing that his charisma and fame intimidated some staffers, he set up a completely different channel that didn’t report to him. It provided him a more pure channel of information. Leaders have to question the source of information they get. Expert advisers in particular fields often have a “line of sight.” They have deep knowledge about a field and early access to information and events. They can spot trends long before they become apparent to a wider audience. Leaders have their own lines of sight. They need to understand the limits of those. And they have to develop relationships with others to give them a portfolio of other lines of sight that are much broader than their own. Six: Invest in your ability to think in the gray space. The higher you progress in your leadership, the more your role is to take your organization where it’s never gone before. You have to be the first to discover a new reality for yourself and your company. That means you push the boundaries of what is known, what’s acceptable, what’s comfortable, what’s legal, what’s practical. That leads you into the land of gray, where things aren’t clear. What do you do when you face a decision that requires you to use judgment in the face of the unknown? Navigating the gray starts with improving your awareness of when and where you are in the gray areas. It’s about options. What are they? Each option has its own potential downside. None is the obvious choice. Which option is best for your team? Which downside can you best survive? Which one generates the most passion? Leaders today must have a realistic picture of themselves. It’s especially true as you develop thinking partners and pursue exponential thinking. You need an accurate picture of how you function best within your organization. Develop your curiosity. It’s hard to explore all the areas that strike your interest, but you have to make time to engage your natural curiosity. Curious leaders have a self-confidence that allows them to remain open and inquisitive. They’re deeply aware of context. And they regularly inquire into their own ignorance, looking for their blind spots and pushing the boundaries of their own knowledge. Curiosity needs guidance and sustenance. We all have natural preferences in how we work. You likely developed these early in your career. How do I fill up my time? How do I feel at the end of the day, when I’ve spent time with people or alone? Which energizes me – meetings with others, or time alone? What kind of environment do I prefer? Do I need chaos and energy or quiet purposeful activity? On page 48 of the hardcover version of the book, the author illustrates a chart you can use to help you discover your management style. Some leaders enjoy debating with colleagues who hold strongly opposing views — so they find potential flaws. Others prefer discourse, starting with an outlined situation and exploring all facets. Others are much more intuitive, preferring to listen to a discussion before following their gut instincts. Knowing yourself will help you know when to ask for a third opinion. Some companies demand written briefs. Others may rely heavily on presentations. What works best for you? Do you learn visually or do you need a conversation to sort things out? It’s up to you to ensure you get your information in the format you can integrate best. You also have to work to develop your other capacities for processing information because sometimes you can’t control the way in which important information is presented to you. Personal marketing has become increasingly a larger part of professional life. Be careful. Your branding is important, but it’s antithetical to exponential thinking and the habit of mind. Don’t believe your own hype. Your awareness must extend to your team. Your styles, strengths, and capabilities are important. Knowing those things about your team is also important. The relationship I had with each man (Kennedy and Johnson) was quite different. When Kennedy called on me, it was usually to play a clearly defined role on a specific problem — from the aftermath of the Bay of Pigs to the Steel Crisis. Johnson, on the other hand, wanted my advice or observations on almost anything that might confront him…Johnson…asked me to participate in important national security meetings which otherwise involved only government officials, something Kennedy never did. In these meetings, I would say little unless asked to comment by the President — and even then I shared my views with him later, only in private. His description captures the essential distinction between two important but different advisory roles: that of the adviser and that of the thinking partner. President Kennedy turned to Clifford mainly as an adviser, calling on him as an expert to engage primarily in expert thinking. Clifford proposed alternatives and solutions to Kennedy’s tough domestic and international political problems. For Johnson, Clifford’s role took on quite different dimensions combining expert thinking with the broader realm of exponential thinking. He would ask Clifford to take on advisory assignments to read and research materials, report back on critical issues and help him find specific alternatives and solutions to tough problems. Distinguishing between these two roles will help you develop the advisory network that is most helpful to you and your leadership challenges. As you start thinking about it, you’ll likely see people who may be good advisory resources, but they’re not as talented in being thinking partners. These distinctions will help you figure out what kind of thinking needs to be done, and will help you clarify the range of resources you need on your inquiry team. To develop the habit of mind, it’s important to understand how other leaders develop themselves and their thinking. There is no one right way. Be curious. Study other leaders. Learn from them. Inner-circle conversations are private and confidential. Look for them. It’s a lifelong process of learning. Next time we’ll talk about chapter 4, Habit of Relationship. I hope you’ll buy the book and dive into it more deeply. Mostly, I hope you’ll consider what you can do to elevate your own leadership and your life. It’s what I call the trifecta of business building: getting new customers, serving existing customers better and not going crazy in the process. My work focuses mostly on helping business owners and leaders accomplish that last one because it permeates every facet of a leader’s life – both professionally and personally. If you’re a small business owner interested in being part of a roundtable group of other small business owners from around the United States, then check out The Peer Advantage. I’m starting the process of building two groups of just 7 business owners to come together as thinking partners to help each other grow their business, their leadership and their lives.